On my way, I met the people from the desert: The Afar, an ethnic nomad group that, during centuries, has been extracting and transporting salt with their camels, from the salt lakes of Danakil to the high lands of Ethiopia. From the high lands of Ethiopia, I continued my travel heading for my next country, Djibouti. They were 70 km way down and using the brakes all the time, from the cold to the hot weather, from 3500 mts high to the level of the sea. 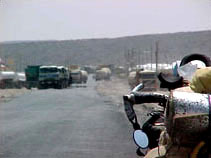 Bati is the town where a great desert begins. In the mountains, people carried their loads by mules and here, in the low lands, the leading role is for the camels. I woke up early in the morning with the idea of leaving quickly; but taking my breakfast, getting cold water and buying some fruits took me more time than I had thought it would. So I started biking after 8 a.m.
Just in my second day I knew that from Bati to the frontier there were more than 300 km, although they were just 240 km according to my map. I didn’t have much information about that place; people from the mountains don’t go to the low lands very often. I only knew that it was a desert area and, according to what I was told, very difficult for biking. I imagined it was not going to be so hard; three days would be enough if I started early in the morning and, of course, if I biked till the evening. Knowing that the road was flat, I planned ingenuously two stages of three hours each, per day. But I failed. Crossing the desert was harder than I thought, maybe the hardest way in my travel through Africa. The first 110 km were along roads of earth. I had to go slowly, so I biked almost all day long. I only stopped for two hours in a small town, where I freshened myself up and had some rest. My mistake was not having lunch. People were very kind and I could have cooked but I wasn’t hungry, it was very hot. In the afternoon I regretted, I felt weak. The heat seemed to burn me, but I had to go on because there were several kilometers left. I arrived in Mille with the first moon light. I was extremely tired, thirsty and hungry. I took a bath and began to feel ill, I had a temperature. I asked the owner of the hotel to cook some food I had for me, then I took some medicine and went to bed. My second day wasn’t less hard: I had problems with the gear lever of my bike and I left late again. To make matters worse, I couldn’t fix it and had to bike with the middle plate for two days. Anyhow, I was going against the wind and although I had wanted to go faster I wouldn’t have been able do it. Although some people had warned me about them, I have proved once again that I mustn’t be influenced by rumors. Due to their isolation, the Afar people have the reputation of being dangerous, but they seemed very friendly to me. Every time I stopped with my bike, they came closer to me very politely, just for curiosity. We understood each other by signs and some words. They invited me to share their shade, they wanted me to stay. “Amesegenalhu, amesegenalhu”, I answered them, which means “thank you very much”. The Afar men by tradition don’t cut their hair, no matter how long the hair is, or how hot the weather is, it’s a question of identity. They also wear long blankets and always carry a big knife. Their houses are made of branches and straw, and the tops are covered with clothes and some animals’ skin. A woman owner of a house invited me to her place and I could see it was not as hot as it looked, although around here every place is a hell. I arrived in Logia around noon; I rested for a couple of hours, ate something and verified some information. The next town was at 75 km, so I wasn’t sure about to stay or leave, but I filled my bottles with three liters of water and went out to the road after 2 p.m. In an hour, the water was really hot. I couldn’t believe it, I touched it and it burned, but at least it took the dryness away from my mouth. Several surprised truck drivers stopped on the road to give me oranges or water, which they kept cold, how marvelous! The desert of Danakil has several areas that are more than one hundred meters under the sea level. It is considered one of hottest and most inhospitable places of the planet. Its temperature can rise to more than 50° C, although by then, according to people, the months of cold were beginning. The temperature hardly rises to more than 40°C, I thought they were joking. On the end of the evening, I saw a couple of snakes crossing the road, and that gave me strength to reach the town and leave behind the idea of camping. I arrived in Dichoto with the moonlight, it was 8 p.m. and I was almost dead. Although I wasn’t feeling well, I left for the road early in the morning after another couple of aspirins. I had to bike a few kilometers, just 65 to reach the frontier. My last day in the Ethiopian desert was a torture: the wind was stronger than ever and, as I went in the direction of the sea, it always blew against me. In the beginning, my average speed was 10 or 11 Km p/h. The hot was terrible, I thought I couldn’t do it, I had no strength and I wondered what the hell I was doing there. I reached the frontier at 11 a.m. I couldn’t believe it; I had biked along 300 km of desert. I was exhausted, my mouth was dry and my body was painful, but I had got it, I was in Galafi.